Entry to the Promotion is open to Australian residents in all eligible states/territories (NSW, QLD, VIC, ACT, SA, WA, NT, TAS) who fulfil the method of entry requirements and are 18 years of age or older. Promotion runs from: 15 April 2019 12:01 AM AEST and ends: 21 April 2019 11:59 PM AEST (no entries will be accepted outside this time). No individual prize will exceed $1,000 and the total prize pool will not exceed $7,000. The Promoter encourages consumers to enjoy alcohol responsibly. Refer to the National Health and Medical Research Council Australian Alcohol Guidelines (http://www.alcohol.gov.au/internet/alcohol/publishing.nsf/Content/guide-adult) for recommended safe drinking levels. 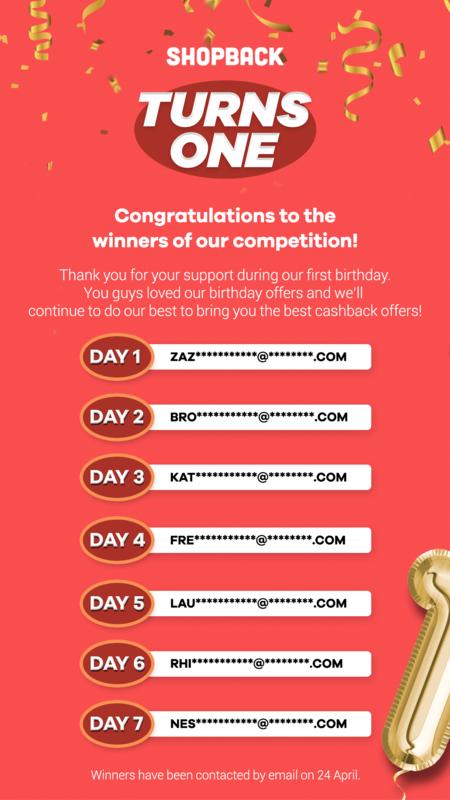 Each time you make a purchase, you receive 1 entry in the daily competition. The more orders you make, the more entries you receive. Entries are only valid for the draw corresponding to the date of purchase and do not rollover. Must be 18 years old and above, be an Australian resident in all eligible states/territories. Order(s) made via ShopBack on the same store each day entitles you to 1 Qualified Order. i.e. If you make 2 orders from Booking.com on 15 April, it would count as 1 Qualified Order. If you make 1 order on Booking.com and 1 order on The Iconic on 15 April , it would count as 2 Qualified Orders. If you still have at least 1 valid item or order that is not rejected, cancelled and/or exchanged in your Qualified Order, your Qualified Order will still be “Qualified”. Entrants must retain copies of all purchase receipts for all entries. All entries by the entrant may otherwise be declared invalid. Unlimited entries are permitted as long as you are an eligible entrant and satisfy the method of entry requirements. A random prize draw will occur 10:00 AM AEST on 24 April 2019 at Level 34, 60 Margaret Street, Sydney NSW 2000. Winners will be notified via Email no later than 24 April 2019 and published on www.shopback.com.au on 24 April 2019. A random unclaimed prize draw will occur 10:00 AM AEST on 26 Feb 2020 at Level 34, 60 Margaret Street, Sydney NSW 2000. Unclaimed prize winners will be notified via Email no later than 27 Feb 2020 and published on www.shopback.com.au on 27 Feb 2020. Authorised under NSW Permit No. LTPM/18/03878.